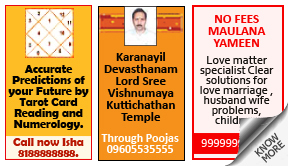 Why place Astrology Ad in Samaja Newspaper ? Astrology is extensively prevalent in India, as are other practices such as tarot card reading and palmistry. Astrology aims to predict and improve people’s lives by synchronizing them with the alignment of planets. If you are an astrologer, card reader or palmist, make haste and book your ads online on Samaja immediately. 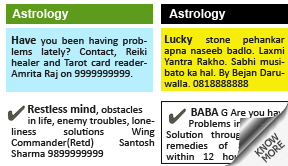 • Sincere practical Astrological guidance from 32 yrs exp. Nrusimha Upasaka KSR Aarudra Iyengar. # 1234516789. • DR. Vijay SHETTY Ph.D.,AFA(USA) ASTROPALMIST tell accurate future advise effective GEMS for all problems/desires"Single visit may change life" PH.9831099699. How To Book Astrology Ad in Samaja Newspaper ? Choose which location you would like to advertise in . Compose your ad. You can take a look at the numerous sample ads archived on our website to refine your ad. Select the date when you would want your ad to be printed, and subsequently clear payment via a host of online and offline means. If you wish to book your ads without any further ado, follow the aforementioned steps. If you wish to know more about Astrology ads, click on the appropriate tab below.